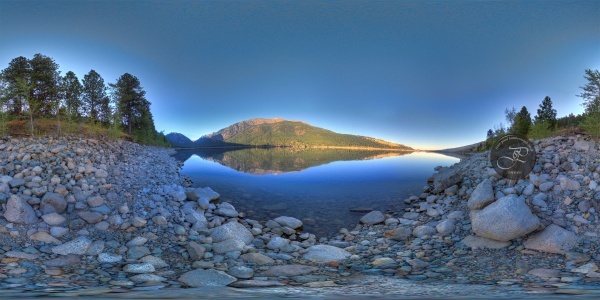 This immersive panorama is taken on the shore of Lake Wallowa in eastern Oregon, a little after sunrise. This panorama was made handheld from 8 images: 4 at roughly 0°, 2 orthogonally at roughly +60° and 2 orthogonally at roughly -60°. The images were then stitched using Hugin and then transformed into a multi-resolution panorama with KRPano. The original stitched image dimensions are 13572×6786 and the version here was made from an image downsampled to 6000×3000 pixels.